Lock in a great price for Hotel Carlton – rated 8.9 by recent guests! The location is unbeatable! You can walk everywhere... the Guggenhiem is so near. And theres are so many bars and restaurants around... to fit every budget. Loved this hotel so well located in downtown Bilbao. Very professional yet friendly staff to help us. We walked to the Guggenheim, walked to the Plaza Nueva and enjoyed the lively city around us while our room was quiet and comfortable. The parking was a bit of a problem as we didn't realize we had to reserve a place with the hotel before arrival. It wasn't hard though to go to the public parking just 5 minutes away. 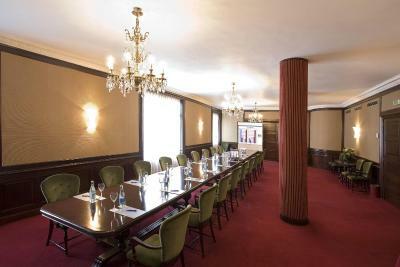 The best classic and tradition hotel in the City. 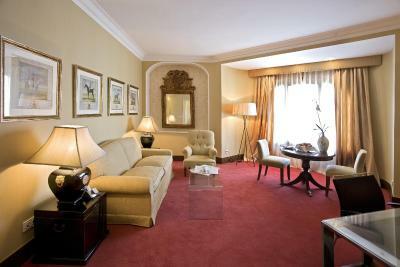 Unbeatable location, luxurious, comfortable, and with the friendliest and most helpful staff. Unbeatable. 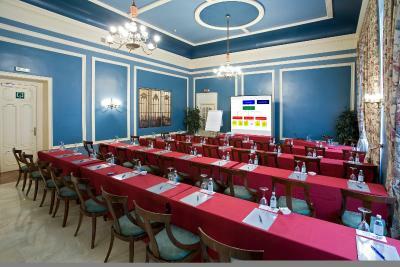 Very helpful staff, excellent location to all attractions, beautiful hotel. Would highly recommend to anyone. Excellent location, staff and the room was incredible. We would definitely stay here again. It exceeded our expectations. The bathroom is very comfortable and also has all the amenities, the room and hotel's decoration is very nice, the seating and bed comfortable with different pillow selection options. Location is really top both from airport and for sight seeing! A real wonderful stay. excellent location with excellent service. Vast room, quiet, clean and very comfy bed. The breakfast was truly amazing. Definitely recommend. This hotel is in the perfect location in the center of Bilbao. 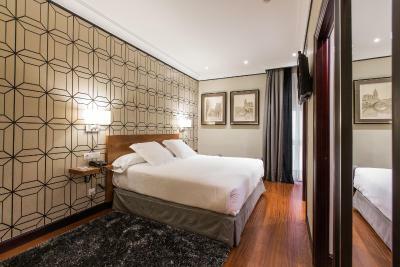 It is conveniently located near the bus stops for the airport and walking distance to all major sights, including the Guggenheim, museum of Balla Artes, and the old town. The room itself was on the smaller side, however the bathroom was large and my room had a terrace. The staff couldn’t have been more accommodating-they happily assisted with restaurant and bar recommendations and also made extending my stay a few more nights a breeze. The area immediately outside the hotel has a beautiful plaza with a fountain as well as many shops that cater to a variety of budgets. If available on your stay in Bilbao, do not hesitate to book. 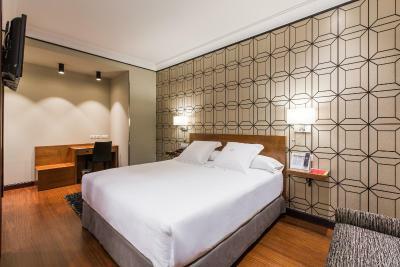 The Hitel Carlton will be my “go-to” place on my next trip—and I will definitely return to Bilbao! Hotel Carlton This rating is a reflection of how the property compares to the industry standard when it comes to price, facilities and services available. It's based on a self-evaluation by the property. Use this rating to help choose your stay! One of our top picks in Bilbao.Located on Plaza de Federico Moyúa square, this elegant hotel stands as an impressive landmark in Bilbao. 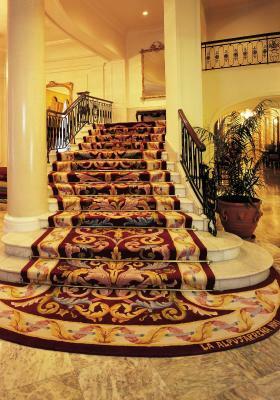 It offers free access to its gym and spacious rooms with luxurious décor. 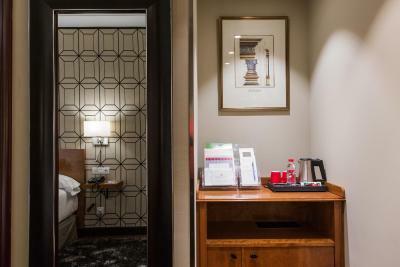 The rooms at Hotel Carlton feature a classic or contemporary design and have a private bathroom. They also have air conditioning and a flat-screen TV. Hotel Carlton offers a business center with a computer and free internet access. There is also a printer and complimentary minibar. Free Wi-Fi is available throughout the hotel. The grand restaurant serves Basque specialties and international classics. The menu changes daily, from Monday to Friday. 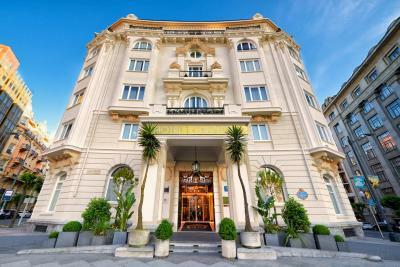 Set next to Gran Vía, Carlton Hotel is less than a 10 minute walk from the Guggenheim Museum. Moyua Metro Station is next to the hotel, providing easy access to Bilbao and its surroundings. The airport bus stops nearby. This property also has one of the top-rated locations in Bilbao! Guests are happier about it compared to other properties in the area. This property is also rated for the best value in Bilbao! Guests are getting more for their money when compared to other properties in this city. When would you like to stay at Hotel Carlton? This type of room does not allow an extra bed. Private parking is available on site (reservation is needed) and costs EUR 28.30 per day. This more spacious room includes a bathrobe and slippers. This type of room allows for an extra bed. This spacious suite with free newspapers. The Hotel Carlton has been an emblematic building. It is officially listed as a Historic, Artistic and Cultural Monument. It is located on Federico Moyúa Square, in the city centre, adjacent to the main shopping and business streets. House Rules Hotel Carlton takes special requests – add in the next step! Hotel Carlton accepts these cards and reserves the right to temporarily hold an amount prior to arrival. Bathroom could use a little more updates. No parking on the premises. Could have used more lighting in the room. Poor bathroom. No working bath tap. No hot water to the bidet. The best location. The front staff was very very helpful. I asked them to freeze my ice pack so that I can bring anchovies in cooler bag, and they did it for me without any problem. Thank you so much!! Every single thing about the hotel was great. No menu at the reception when restaurant was closed, I just wanted to read the menu. The size of the rooms. Thanks for letting me check in early! The room was lovely and the staff were very nice. Bar didn’t feel very ‘cosy’, a typical hotel bar one would find anywhere - but not a problem. Friendly staff. Fabulous buffet breakfast. Disturbed by noise from the square at night and by a guest’s dog barking for hours in a nearby room. Breakfast was okay but understaffed and not replenished enough. Great location. Clean. Elegant. We enjoyed the bar.